Every night after dinner, the Hubs and I love to take a stroll by the river and every night my children whine, complain, and cry that their feet hurt. Our evening pattern of walking, only to have our kids poop out, whine, complain, cry, and end up being carried or scolded all-the-way-home is getting beyond ridiculous. So today (duh!) I remembered this fabulous idea from this book pictured above. Make a nature bracelet. Simply stick a piece of tape around their wrists sticky side up, and while on your walk let them explore for treasures to place on their bracelets. Do you see my children post-walk? No tears to speak of. In fact they look rather radiant! Never mind the fact that they wanted the bracelets off the second they got home and enjoyed destroying the flowers as much as they enjoyed collecting them! I was so happy to get through our evening walk without a bunch of drama! If you are a parent of an elementary-aged kiddo, you need this book. (And no, I’m not getting paid or compensated in any way to say this. I just love this book and like to pass on good things when I see them!) At first glance it appears to be for kids with special needs. Don’t let that stop you from taking a look. This book is for ALL children and will literally SAVE YOU from ever having to hear the words “Mom, I’m bored” again. Just take a look below and see for yourself. Enjoy! As an early interventionist and a former special day class preschool teacher, how did this book miss my radar?! Thanks for the tip! I cannot wait to peruse it! 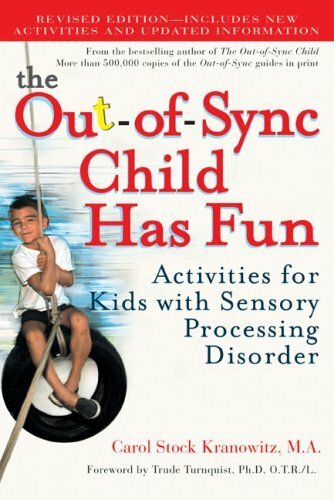 My son has Sensory Processing Disorder and I have loved Carol's other books on this issue. Thank you for sharing this; will pass it along to the Sis. Since I have an 18 yr old and a 13 months baby, I will just have the oldest babysit! ahhhh, the joys of free child labor. Looks fun! Great idea- very creative! This is such a creative idea! I don't have any little ones, but I know a few people who do whose kids would love to do this. what a great idea!!! i may need to get that book! What a great idea Beth. I love that. I am definitely doing this with my kids this summer. Oh my stars and hearts!!!!! I needed this post! I am a former elementary school teacher. I have crates of stuff upstairs, and what do I do most days? Wonder what I am going to do with my child!!! How awful is that?!? I love the nature bracelet! That is fabulous. I keep saying I am going to pull a tub out and do a unit of study with her, but I just don't. I hate to say that I am lazy, but I think I am when it comes down to it! Bad mom! Bad mom!! You have motivated me to do just the simple things. Going to buy this book! THANK YOU!!!! Thanks for sharing this! I always find it easier to take a recommendation (and the blogger themself) seriously when I know they aren't being compensated to say that they like something.